Linda produces engaging and relevant photographs for your property address website that truly bring your property to life and help put your online presence ahead of the competition. It's a smart marketing tool. Linda provides great customer service and quick turnaround to meet the demands of this fast-paced market. 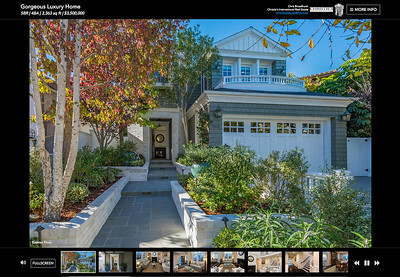 Display your photo, your name, company name and logo on all your real estate virtual tours. For use on the MLS. Quickly and easily post your tour to all of your social media sites including Facebook. Plus, every tour comes with our Get & Share button which allows users to share your tour with their friends on Facebook. A video of your virtual tour created and uploaded to YouTube.com for additional exposure but no additional cost! We generate a flyer with each virtual tour. Multiple images can be transformed into panoramas quickly and easily for the wide screen field of view. Copyright © 2018, Linda M. Cotter. All rights reserved.